The context of this Sunday’s Gospel is dramatic (John 12:20-33).Jesus has just entered Jerusalem. He’s accompanied by an enthusiastic crowd. Some of the onlookers began to believe in Him while others, the leaders of the people, were frustrated and angry. A third group, some Greeks who had some attachment to Judaism, went to Philip and wanted “to see Jesus” – they wanted to come to know Jesus Christ and become His friends, to be in communion with Him. Yes, for us “to be,” Father Francis Martin notes (Magnificat.com), is to be in communion with the Holy Trinity: God the Father, Son and Holy Spirit. And how does Jesus respond to the request? For the first time in the Gospel of Saint John, Jesus declares: “The hour has come for the Son of Man to be glorified.” Jesus Christ’s glorification radiates in His love – love that is manifest in His suffering, dying, and rising from the dead, thus glorifying God the Father. Jesus prays as He taught us to pray: “Father, glorify Your Name,” just as we pray in the Lord’s Prayer, “Our Father, Who art in Heaven, hallowed be Thy Name” – may Your name be Holy in us, in our words and deeds. As disciples of Jesus Christ, we “want to see Jesus” and follow Him, to be in communion with Him. 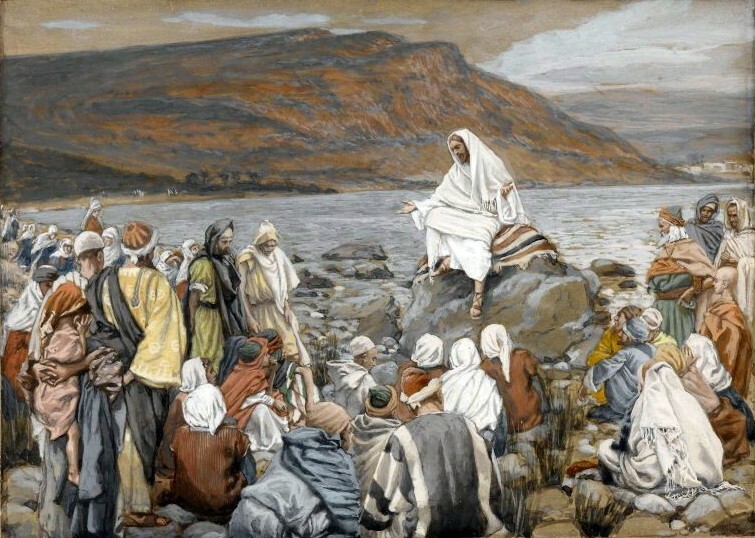 So we have been striving to follow His instructions once again this Lent – we fast, pray and give alms (Matthew 6).And as our Lenten journey concludes in 2018 and we prepare to celebrate the Passion, Death and Resurrection, and Ascension of Our Lord and Savior Jesus Christ at Easter, we realize that Jesus calls us to come to Him, not just during Lent, but every day. He calls us to follow Him and love Him, to be in communion with Him in daily prayer, in His Church, Word and Sacraments – gifts that He has given to help us to enter into communion with His Heart and to live in the mystery of the Holy Trinity. By God’s grace, we also follow Jesus by loving our neighbor through spiritual and corporal works of mercy (for example, praying for and forgiving others, praying for the living and the dead, feeding the hungry, caring for the sick…).We follow Jesus evermore closely by walking with and seeking the intercession of Jesus Christ’s Mother, the Blessed Virgin Mary, and the intercession of all the saints. May God the Holy Spirit give us the fortitude we need each day to follow Jesus, conforming our hearts to the Heart of Christ, despite the hardships we might be suffering. Let us pray: Loving God, Father, Son and Holy Spirit, conform our hearts to the Heart of Jesus Christ and give us His peace. Help us to truly be who You call us to be, in communion with Thee. Amen.